Hello, dear readers. I have some important questions to ask you. Are you looking for a little action? Maybe a little adventure? Want to slay some monsters and grab some fantastic loot? 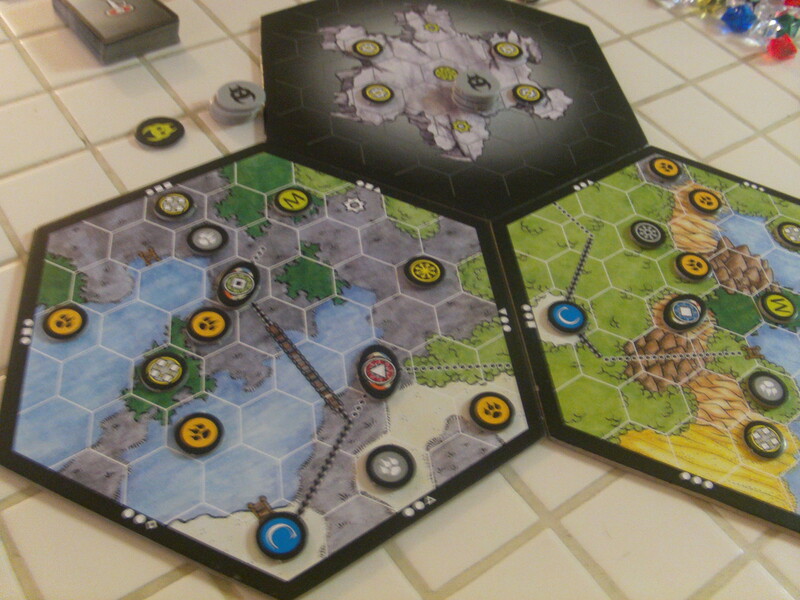 Want to do it all while rolling tons of dice and moving tokens on a modular board? 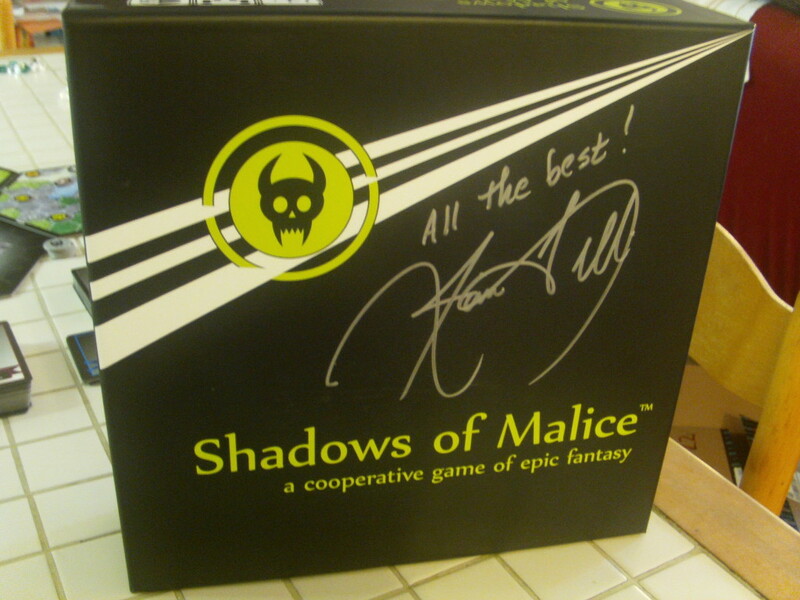 Well then, I have the fix you need- it’s called Shadows of Malice and is a cooperative adventure game for 1-8 players from Jim Felli and published by Devious Weasel Games. The gist of the game is that a shadowy evil demon called Xulthûl is trying to emerge into the material plane. How, you ask? Well, he’s sending out shadowy minions to find and overwhelm one of the mystic Light Wells of the material plane- if they do so, Xulthûl will return to bring about an age of darkness. Suffice to say, that would be bad news. Luckily, you and your compatriots can avert this calamity by finding and uncovering all the Light Wells on the board yourself. How, you ask? (What are you, a parrot?) Why, by making your way to an uncovered Well on the board, defeating it’s Guardian and flipping it over to reveal either a Dark or Light Well- if it’s Dark, the search continues, if it’s Light, the search still continues because more than likely, you’re playing with more than one Light Well on the board (because the board is modular and the more board pieces you start with, the more Wells there are to uncover. Does this sound confusing? I’ll simplify: find all the yellow tokens before the bad guys find one. If they do, you will have a climactic battle with the ultimate boss which you will almost assuredly lose. The main facet of this game is both its strength and its weakness and that is randomization. 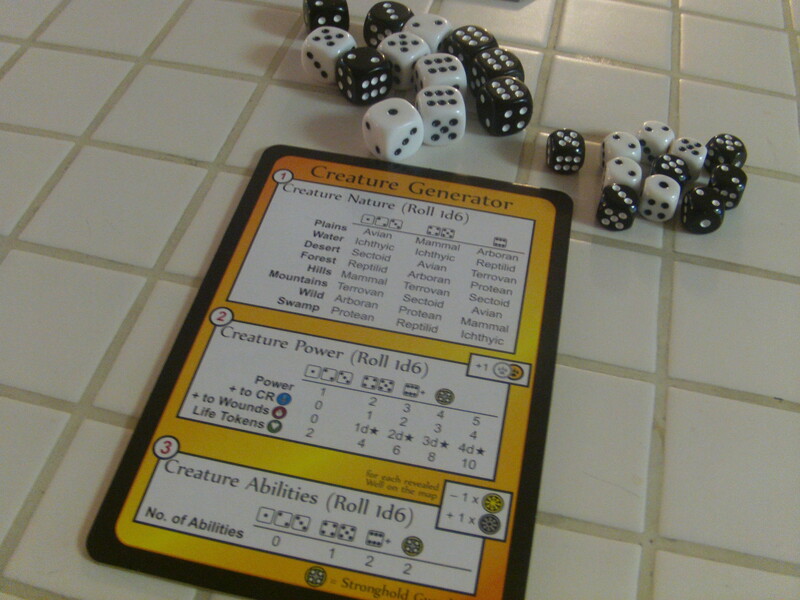 From the statistics of each creature that you fight (which are determined by dice rolls) to the combat itself (which is determined by dice rolls) and from the movement of the Shadow Minions of Xulthûl (which are determined by dice rolls) to the treasure, blessings and curses that you’ll receive (which will be determined by drawing a card from a deck) almost everything that you do will be determined in a random way. 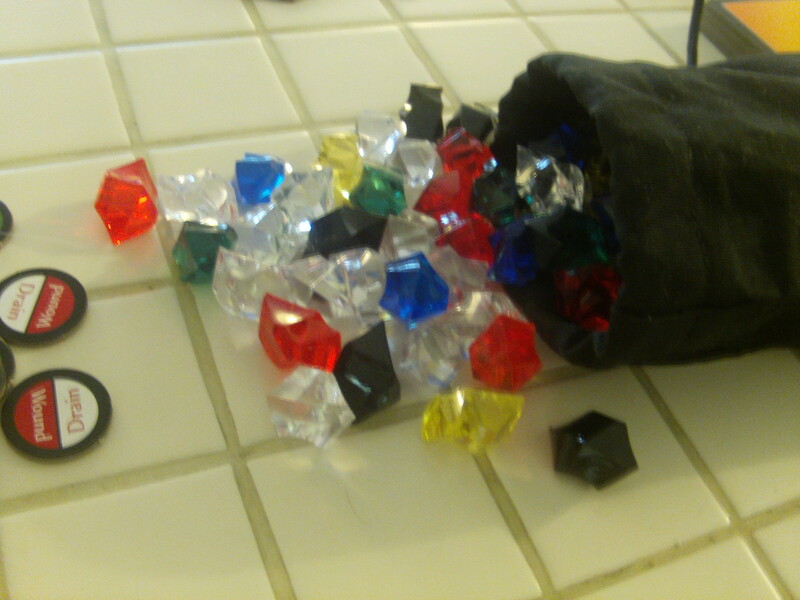 If you don’t enjoy rolling dice and doing math, beware, because here be monsters. On the plus side, this gives great replay value to this game- every game will be different. On the other hand, this also means that every game will be different. Play this game one day and you may breeze through with stunning ease. Play it another day and you will feel a torturous slog to make any progress at all. Again, this adds great amounts of replay value, but if you are the type of person who gets frustrated easily or feels the need to win the games you play, you might want to steer clear of this one. Defeat enemies and you’ll get Soulshards, which you can pay to affect die rolls or use special powers. Now, this game has received some criticism due to its art style, which is frankly minimalistic. There are no picture of any creature that you face, no miniatures on the board and each square of terrain is simply depicted (either water, trees, grass, desert, swamp, hills or mountains.) However, while I appreciate a gorgeously illustrated game as much as the next person (if you’ve read my reviews before, you’ll know how true this is) frankly, I liked this minimalist approach. This game harkens back to the roleplaying games of old, where a healthy imagination was a key component to enjoying the experience. The options of what types of creatures you’ll face are so random, it would have been impossible to depict them without this game being even more massive than it already is. However, although this game has its roots firmly in the world of the rpg, it lacks one aspect of that genre: level progression. That’s right, your character will not level as the game proceeds and their stats will not increase. In order to improve your character, you’ll need to either defeat creatures in their lairs (which can be difficult, depending on what type of monster you roll to create) or defeat the Guardian of a Well (which will always be even more difficult than a creature in a lair) and obtain a treasure card. I think you can see where this is going. 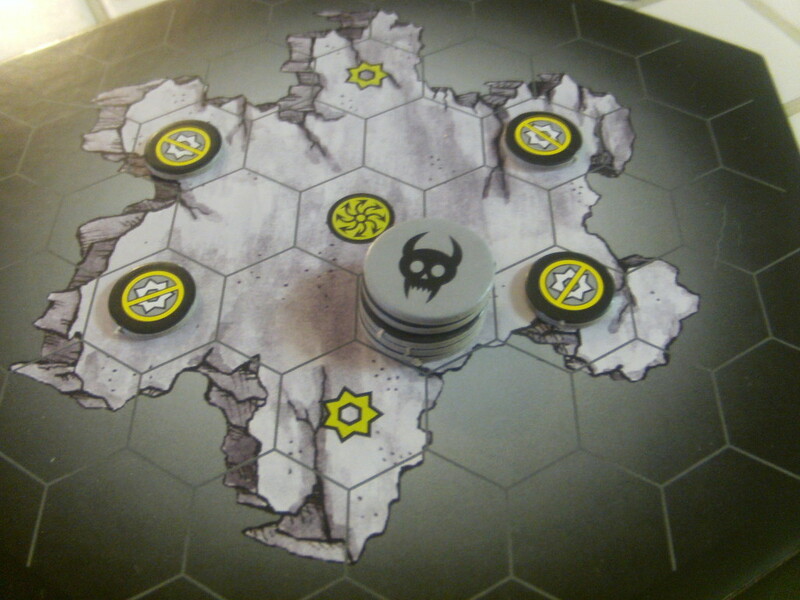 If in the beginning of the game, you continue to roll hard monsters during their creation, you are almost certain to not improve your character’s position. Again, randomization can be a double edged sword. As you might have seen last week in my interview with this game’s creator, Jim Felli, there is an expansion coming out soon titled Shadows of Malice: Seekers of a Hidden Light which purportedly adds side quests and new rewards which can make the game a much easier experience. 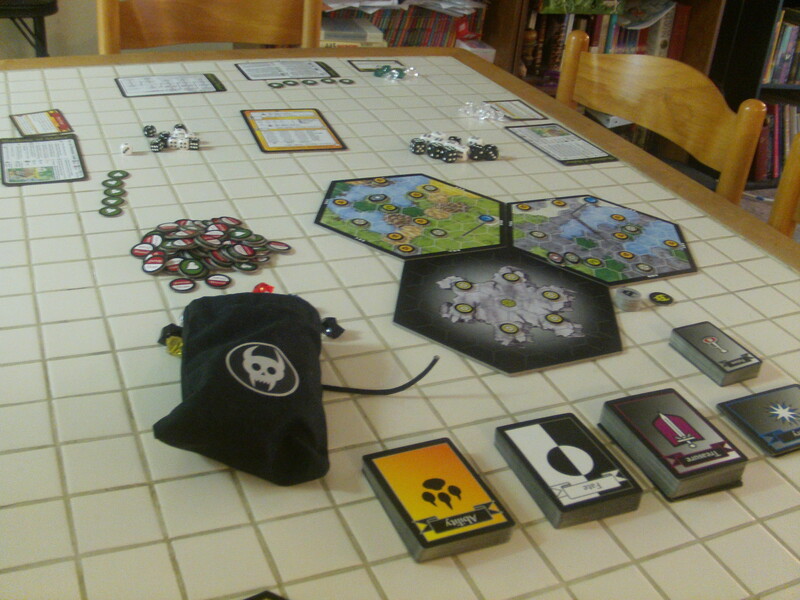 Until you get your hands on it, a few house rules can tailor the game to your own needs. Will you succeed in your adventure? Ultimately, Shadows of Malice is an incredibly interesting dive into the world of adventure games and rpgs in particular. If you’re looking for a stepping stone between most board games and heavier roleplaying experiences such as Dungeons and Dragons, this game makes an excellent stepping stone. Personally, with this game as it is, I enjoyed it immensely more as a single-player experience- one where I don’t have to worry about guests getting frustrated by its sometimes steep learning curve. We at A Space ahead recommend that you try this one out to see what you think. There is a great game here, you just need to handle it with care.